This time of year, it’s always a challenge to stay focused on quality nutrition. There’s always extra baking, dinners out, birthday parties, and getting together, celebrating with family and friends. And it’s the time of year when everyone’s wants to make their favorite holiday dish…which usually means lots of butter and sauces. Although the first few bites are delicious, before you know it, you’re packing in the calories….and your jeans start feeling snug. Anybody relate? That’s why I try to fix quick and healthy vegetable dishes when I’m at home. This recipe is light yet tasty and can be served as a side or as a main dish with rice. Leann, this looks amazing! 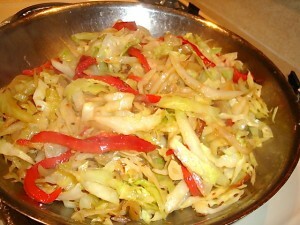 I LOVE veggies, garlic, onion – the “perfect” combination! Thanks for sharing…. Yum,Yum………Tried this for a great one skillet supper and loved it…..I did add 1 tsp. apple cider vinegar as I grew up with cabbage cooked with a little vinegar and added a grilled italian sausage to complete the meal. Thank you Leann for another wonderful recipe!! So glad it worked out well for you! You made my mouth squirt when you mentioned the grilled Italian sausage. YUM! What a great idea!